Superb location built on the harbour of this historic picturesque town with its magnificent castle and Segontium Roman Remains. Ideal for trips into Snowdonia on the Welsh Highland Railway which is just a few minutes walk away. The hotel is modern and provides spacious air conditioned bedrooms and has an on-site Table Table restaurant serving good value contemporary meals throughout the day. 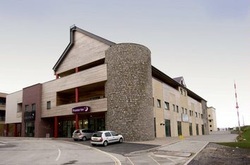 Book direct for the best Premier Inn Caernarfon deals.